The offseason at Agganis Arena has largely been defined by dreams of what could be, and the hype train received an extra push Tuesday afternoon at TD Garden. Hockey East announced the No. 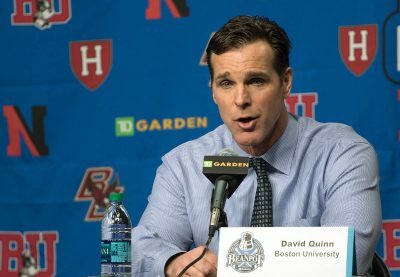 4 Boston University men’s hockey team earned the top spot in its preseason poll, offering a league-wide recognition of the squad head coach David Quinn has assembled. The Terriers received 10 of 12 first-place votes, marking another hallmark in a week where the Terriers also led the Hockey East Writers and Broadcasters Association preseason poll. Talk, however, means little to BU, with junior forward and assistant captain Nikolas Olsson stressing hardly any stock is given to outside noise. A similar sentiment was expressed by sophomore forward and assistant captain Jakob Forsbacka Karlsson, who said the Terriers aren’t letting expectations – internal or external – get to their heads. Such thoughts were surely music to Quinn’s ears, who hit home that much can change as the regular season unfolds from October through February. Even with arguably the most talented roster in college hockey – 11 NHL draft picks call Commonwealth Avenue home – Forsbacka Karlsson returned to the idea that nothing will come easily for BU this season. After all, as he recalled, now-No. 15 Northeastern University started 2015-16 with a 3-12-3 record, only to win the Hockey East Tournament. Such a trajectory, Forsbacka Karlsson said, shows how unpredictable Hockey East can be, and that’s something Olsson echoed, too. And with 22 Hockey East tilts and 14 non-conference tilts looming, such a mentality will be needed early and often. After all, the preseason poll’s top six is rounded out by a “who’s who” of college hockey in Northeastern, the University of Notre Dame, the University of Massachusetts Lowell, Providence College and Boston College. Sure, each team has lost premier talent to graduation or the pro ranks, but that doesn’t mean BU’s job will be easy by any means. All things considered, BU is well aware of the various obstacles that will stand in its way, especially with a national and regional target on its back. As Quinn put it, the Terriers are guaranteed to get every team’s “A game,” home or away. Their first chance respond to that hype comes on Saturday night in a scrimmage against the University of Prince Edward Island. At that point though, senior captain and defenseman Doyle Somerby said, talk goes out the window.